If you've followed the discussion and read any of the thousands of articles on medication adherence over the last 40 years, you're well aware that we have not gained much ground on nonadherence and this aspect of safe and effective use of medications. Complicating the issue of adherence is the fact that the sheer volume of medications used today in health care is far greater than that of 40 years ago, making the fundamental issues underlying adherence more difficult to reach and the problems created by nonadherence larger, more costly, and more laden with risk. Older adults are often at highest risk because of the number of comorbidities and the large number of medications often used among this group. So how can such a large problem originating from such a seemingly simple issue—the proper taking of medications—elude a satisfactory solution for so long? How can medications, one of science's most important therapeutic tools, have become one of medicine's greatest problems? It may not be a simple issue and, in fact, may require a paradigm shift in the way we approach medication use in the future. Physicians play a key role in addressing some of the barriers to medication adherence that have yet to be successfully overcome and that tend to foster the problem of nonadherence. It is important that prescribers and health care professionals directly engaged with patients and their medications be familiar with and attuned to recognizing both overt and subtle signs of potential barriers to adherence. This is no simple task because of the variability among patients, so a key indicator in one patient may not be a factor in another. • Social and economic barriers may include language, health literacy, living conditions, access to health care facilities, and health insurance. • Health care system barriers may emerge from provider-patient relationships; provider communication skills; disparity in beliefs between provider and patient; a lack of positive reinforcement from the provider; a weak system capacity to educate patients and provide follow-up; a lack of knowledge about adherence and effective interventions for its improvement; patient information materials written at too high a literacy level; restricted formularies necessitating medication changes; high drug costs, copayments, or both; poor access or missed appointments; long wait times; and a lack of continuity of care. • Condition-related barriers may derive from chronic conditions, a lack of symptoms, severity of symptoms, depression, psychotic disorders, or mental retardation/developmental disability. • Therapy-related barriers may emerge from the complexity of a medication regimen (eg, number of daily doses, number of concurrent medications), treatment requiring mastery of technique (eg, inhalations, injections), duration of therapy, frequent changes in medication regimen, a lack of immediate benefit of therapy, medication with a social stigma attached, actual or perceived unpleasant side effects, or treatment interfering with lifestyle or requiring significant behavioral change. • Patient-related nonadherence may arise from physical factors such as visual impairment, hearing impairment, cognitive impairment, impaired mobility or dexterity, or swallowing problems. Psychological or behavioral barriers may spring from a patient's knowledge about a disease; the perceived risk or susceptibility to disease; understanding of the reason a medication is needed; expectations or attitudes toward treatment; the perceived benefit of treatment; confidence in the ability to follow a treatment regimen; motivation; fear of possible side effects; fear of dependence; feeling stigmatized by the disease; frustration with health care providers; psychosocial stress, anxiety, or anger; or alcohol or substance abuse. From among the five WHO dimensions, patients typically provide several reasons for nonadherence,1,2 including a patient's perception of unrealistic goals of therapy, medication costs, fear of medication side effects, a lack of immediate visible benefits, not knowing how to take or use the medication(s), previous negative experiences with medications, complexity of medication regimens, cognitive impairment, and forgetfulness. Nonadherence can also emanate from caregivers who are primarily responsible for administering or overseeing a patient's medications, because their own predispositions and thoughts about medications may unwittingly impact the decisions they make for the patient for whom they are caring. A growing number of national efforts have developed strategies aimed at improving medication adherence. The star ratings of the Medicare Part D prescription drug plans now include medication adherence measures for statins, renin-angiotensin system antagonist use in hypertension, and for oral diabetes agents. In 2013, the National Council on Patient Information and Education published "Accelerating Progress in Prescription Medicine Adherence: The Adherence Action Agenda" to address America's "other drug problem. "4 The document conflates the element of aging being correlated with a higher prevalence of chronic disease, greater numbers of medications used, and increased complexity of medication regimens, serving to amplify the risks of medication nonadherence in older Americans. The report describes the Adherence Action Agenda, around which stakeholders would coalesce to reach common goals of improving patient adherence with medications and reduce the burden of chronic disease. One might characterize the current paradigm around the process of prescribing, dispensing, and monitoring medications as one in which patient adherence is simply assumed. A patient leaves the physician's office with a prescription for a medication that is somewhat mysterious to him or her, for which the patient may have received some instructions on how to take it, and proceeds to the pharmacy to have the prescription filled. On the follow-up visit, the patient is hopeful that signs and symptoms of the diagnosed and now treated condition have changed for the better. If not, an adjustment to medication is made and follow-up is again scheduled for a later date. In this scenario, the assumption is that the patient understands what has been verbally explained, understands that the medication is important, and will have the prescription filled and self-administer as instructed. In addition, it is assumed the patient will contact the prescriber if any questions arise or side effects are encountered. • Although the group uniformly felt responsible for assessing and promoting medication adherence, only a few asked detailed questions about adherence. • Although providers often checked medications taken, they rarely explicitly assessed adherence to medication regimens. • Many physicians expressed discomfort about intruding into patients' territory to detect nonadherence and rarely asked about missed doses. • Most nonadherence cases detected during an office visit were revealed through unprompted patient comments. The authors concluded that addressing nonadherence will require a new approach incorporating joint patient-provider responsibilities and new protocols to guide discussions worth exploring. Armed with an awareness of the many factors that drive nonadherence, how do providers respond to a call for action to improve medication adherence? It is helpful initially for the prescriber to become familiar with the five dimensions defined by WHO as well as some of the common concerns patients have about their medications. Medical literature clearly reiterates the need for dialogue and the building of a partnership between the prescriber and the patient related to medication adherence. Underlying this dialogue is the need for a trust-based relationship between prescriber and patient. Skillful inquiry by a prescriber can lead to a highly effective assessment of risks for nonadherence and serves the patient well in mitigating factors leading to nonadherence. Techniques for patient interviewing are important to ensure that the patient is comfortable in sharing information that might otherwise cause embarrassment, feelings of having done something wrong, fear of reprimand, and other feelings that would tend to close down free communication. The evolution of the process of providing care has brought about the concepts of the medical home and the accountable care organization. Common to these models is the concept of the health care team working collaboratively to achieve optimal patient-centered outcomes. This model of providing team-based care seems to fit the need for assessing patients over broad domains such as those described by the WHO for medication adherence. The prescriber should not feel that the burden of improving medication adherence lies solely with him or her. Other efforts are under way to build an infrastructure of support for reducing medication nonadherence. Medication therapy management (MTM) is another tool that has demonstrated positive results. Though not all MTM programs are identical, the concept of identifying patients with higher risks of nonadherence and providing appropriate interventions has proven worthwhile. Medicare Part D prescription drug plans are required to provide a form of MTM defined by the Centers for Medicare & Medicaid Services. Health insurers, including self-insured plans, have incorporated MTM programs into their prescription drug benefits. Pharmacists are providing MTM services and many are becoming specialized in this process, interacting with patients in a variety of ways, including face to face, via videoconferencing, and over the phone.15 A number of certificate programs are offered to train pharmacists in the principles of MTM services. Since the earliest work described as compliance by Sackett,16,17 recognition of medication nonadherence's significance in today's health care system in terms of morbidity, mortality, and burden to the health care system in both poor control of chronic diseases and overall costs of care has grown among health care providers and payers. It's clear that a solution needs to be found. Indeed, health care payers have recognized the significance of the cost of the $250 billion problem, having now included medication adherence in their star ratings systems. Integrated health care systems are implementing comprehensive policies and procedures to address adherence. The morbidity and mortality associated with medication nonadherence cannot be ignored, and there is rationale proposed that medication nonadherence be considered a condition, like a disease, and treated as such by being diagnosed and treated. In patient terms, it is estimated that 125,000 deaths are attributed annually to medication nonadherence, a number sufficiently significant to rank among the top 10 leading causes of death in the United States. Risks to patients are expressed by the fact that medication nonadherence means inadequate treatment of their diseases, resulting in both a lower quality of life and an increased burden to the health care system overall through repetitive, suboptimal attempts to adequately treat a condition. The problem of medication nonadherence has long been recognized and has been fostered not by one or two independent factors, but rather the paradigm in which our health care system exists. The emphasis on productivity in the physician's office and in the pharmacy makes it difficult for health care professionals to allocate time to investigate and interview patients for health literacy, build trusting relationships, and adequately assess medication adherence. From the thousands of articles on the problem of nonadherence and the remedial efforts found to be effective, it is apparent that shifting the paradigm is no simple task. Common themes in the literature include providing education to increase awareness of the problem of nonadherence and the reasons for its occurrence and persistence, developing prescriber-patient relationships built on trust and collaboration so the issue of adherence can be freely discussed, and making adherence important in the everyday routine. — Lee Meyer, PharmD, CGP, FASCP, of Irvine, California, serves as a consultant to the long term care industry. His company, M2:Pharmacist Services, focuses on clinical, regulatory, quality assurance, and cost containment activities related to medications and drug therapy for both long term care facilities and pharmacies. He served as the director of pharmacy for Golden Living, a national nursing home chain, and chaired the company's Medication Safety Team. He is a past president and chairman of the Board of the American Society of Consultant Pharmacists and is a member of the American Geriatrics Society. 3. Osterberg L, Blaschke T. Adherence to medication. N Engl J Med. 2005;353(5):487-497. 4. National Council on Patient Information and Education. Accelerating Progress in Prescription Medication Adherence: The Adherence Action Agenda. Rockville, MD: National Council on Patient Information and Education; October 2013. 6. Vermeire E, Hearnshaw H, Van Royen P, Denekens J. Patient adherence to treatment: three decades of research. A comprehensive review. J Clin Pharm Ther. 2001;26(5):331-342. 7. Prescription drug trends. Kaiser Familly Foundation website. http://kaiserfamilyfoundation.files.wordpress.com/2013/01/3057-08.pdf. Updated May 2010. 8. National Priorities Partnership. Compact Action Brief: Improving Patient Medication Adherence: A $100+ Billion Opportunity. The Network for Excellence in Health Innovation. http://adhereforhealth.org/wp-content/uploads/pdf/ImprovingPatientMedicationAdherence-NPP_Patient_Medication_Adherence_NQF.pdf. 9. Jimmy B, Jose J. Patient medication adherence: measures in daily practice. Oman Med J. 2011;26(3):155-159. 10. Marcum ZA, Sevick MA, Handler SM. Medication nonadherence: a diagnosable and treatable medical condition. JAMA. 2013;309(20):2105-2106. 11. 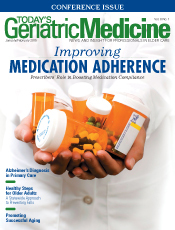 Atreja A, Bellam N, Levy SR. Strategies to enhance patient adherence: making it simple. MedGenMed. 2005;7(1):4. 12. Cheung K, Hicks J, McEwen B, Cianfarani G. Strong healthcare provider-patient relationship improves patient adherence and lowers healthcare costs: a meta-analysis. MedCred website. https://www.medcred.com/libs/pdf/healthcare_portfolios_patient_adherence.pdf. 2012. 13. Piette JD, Heisler M, Krein S, Kerr EA. The role of patient-physician trust in moderating medication nonadherence due to cost pressures. Arch Intern Med. 2005;165(15):1749-1755. 14. Wroth TH, Pathman DE. Primary medication adherence in a rural population: the role of the patient-physician relationship and satisfaction with care. J Am Board Fam Med. 2006;19(5):478-486. 15. Cipolle RJ, Strand LM, Morley PC. Pharmaceutical Care Practice: The Patient-centered Approach to Medication Management. 3rd ed. New York, NY: McGraw-Hill; 2012. 16. Sackett DL. Introduction. In: Haynes B, Taylor, DW, Sackett DL, eds. Compliance in Health Care. Baltimore, MD: The John Hopkins University Press; 1979:1-7. 17. Sackett DL, Haynes RB, eds. Compliance with Therapeutic Regimens. Baltimore, MD: The Johns Hopkins University Press; 1976.